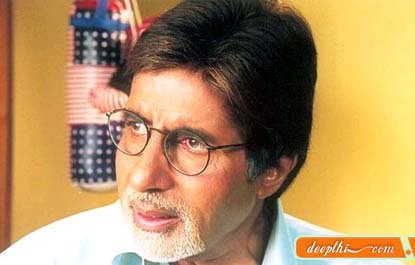 Amitabh Bachchan still strike the gold at the box office with the success of Baghban the senior superstar has made a statement against ageism in the industry. In 2003 he lined up more projects, more varied roles, more endorsements than any other younger actors. He lined up with Khakee, Aetbaar and Lakshya. As more successful he gets more self deprecating he is becomes. He likes to knock his acting, downplay his formidable connections. But his influence inside and outside the industry grows. The aura for him gets bigger. At the age of 61 when youngsters do one movie at a time he zips from one set to another. He takes risks whether it is sporting over the Top Wigs, freaking out in Funky Videos or playing the Dour Patriarch and all too stylish. Amitabh Bachchan is in popular parlance, the king of Indian cinema was born on October 11, 1942 in Allahabad, Uttar Pradesh, India . Son of well known poet Harivansh Rai Bachchan and Teji Bachchan. He went to Sherwood College, a boarding school in the hill-station town of Nainital, and from there to Delhi University where he earned a double MA degree. He was a former stage actor, radio announcer and freight company executive in Calcutta, India.When he was just trying to get a break in movies he was told to soften his 'deep' voice. However it was soon realised that his deep rich voice was excellent for narration. He has provided narrations for several films.Married to Jaya Bhaduri, a well known actress, he has two kids, Shweta and Abhishek. His first movie was Saat Hindustani (1969). He came to be known as 'The Angry Young Man' after his film Zanjeer (1973), which made him a superstar. He also ran for seat in the Congress from his hometown but had to leave midterm because of controversies. While shooting for Coolie (1983) he received a near fatal injury. He was hospitalised and the Indian press issued daily bulletins on his health. He is highest paid Bollywood actor in the film industry. Amitabh had a very close association with the former Indian Prime Minister Indira Gandhi and her son Rajiv Gandhi (also Prime Minister) and he was elected to parliament with a huge majority from his home town of Allahabad. But in politics he did not last long and was implicated in the infamous Swedish Bofors Gun deal scandal along with Rajiv Gandhi and others. He launched a multi-faceted commercial enterprise known simply as Amitabh Bachchan Corporation Limited, or ABCL. ABCL is engaged in production, distribution and all other aspects of the movie industry. He was considered finished in the late nineties after super star status for 20 years a string of flops and failed political and business ambitions. He faced major health problems and financial crisis. But his unexpected comeback as host of the popular TV quiz series 'Kaun Banega Crorepati' version of Who Wants to be a Millionaire which put him right back on the number one spot of Bollywood actors over 40 reaffirming his reputation as the living legend of Indian cinema with a new series of high profile films Mohabbatein (2000), Kabhi Khushi Kabhie Gham (2001) etc. He is announced as an actor of the Millennium in a BBC News Poll ahead of such luminaries as Charlie Chaplin, Sir Lawrence Olivier, and Marlon Brando. He is the first Asian actor having a wax model of his likeness displayed at Madame Tussaud's in London. One of his film Boom made lot of people unhappy. All are shocked what he had done, it was not the right decision to select that film people believed. And he felt sorry for the people who were upset from his appearance in the film. But he said the character he played in it is repulsive. And he is doing that only which going to be not liked by people. In that regard he feel a sense of achievements. Mostly the other stars are keen to work with Amitabh, but he is one who desire to work with Tabu for many years but no one is taking it seriously. Let see when he gets the opportunity to work with her. Amitabh Bachchan's forthcoming film will be Bunty Walia's Just panjabi which is being directed by Apoorva Lakhia. Other co stars Sanjay Dutt and Lara Dutt. Sanjay Leela Bhansali's Black. And his AB Corp's vehicle which he is relaunching with Abhishek Ranveer. Family - Ties Of Blood ( Amitabh Bachchan, Akshay Kumar, Aryeman, Bhumika Chawla), Ek Ajnabee ( Amitabh Bachchan, Perizaad Zorabian, Vikram Chatwal), Dil Jo Bhi Kahey ( Karan Sharma, Amitabh Bachchan, Revathy, Annabelle Wallace, Bhumika Chawla), Viruddh ( Amitabh Bachchan, Sharmila Tagore, John Abraham, Anusha Dandekar), Sarkar ( Amitabh Bachchan, Abhishek Bachchan, Kay Kay, Katrina Kaif), Paheli ( Shah Rukh Khan, Rani Mukherjee, Juhi Chawla, Amitabh Bachchan, Sunil Shetty, Anupam Kher), Bunty Aur Babli ( Abhishek Bachchan, Rani Mukherjee, Amitabh Bachchan), Waqt � A Race Against Time ( Amitabh Bachchan, Akshay Kumar, Priyanka Chopra), Black ( Amitabh Bachchan, Rani Mukherjee), Ab Tumhare Hawale Watan Saathiyo ( Amitabh Bachchan, Akshay Kumar, Bobby Deol, Divya Khosla), Kyon, Ho Gaya Na ( Aishwarya Rai, Vivek Oberoi, Amitabh Bachchan), Lakshya ( Hrithik Roshan, Preity Zinta, Amitabh Bachchan), Deewar ( Amitabh Bachchan, Akshaye Khanna, Amrita Rao, Sanjay Dutt), Dev ( Amitabh Bachchan, Om Puri, Amrish Puri, Fardeen Khan, Kareena Kapoor), Hum Kaun Hai ( Amitabh Bachchan, Dimple Kapadia, Mausami Chatterji, Dharmendra), Aitbaar ( Amitabh Bachchan, Bipasha Basu, John Abraham), Khakee ( Amitabh Bachchan, Ajay Devgan, Akshay Kumar, Tusshar Kapoor, Aishwarya Rai), Baghban ( Amitabh Bachchan, Hema Malini, Salman Khan), Boom ( Amitabh Bachchan, Jackie Shroff, Katrina Kaif, Padma Lakshmi, Madhu Sapre, Gulshan Grover), Armaan ( Amitabh Bachchan, Anil Kapoor, Gracy Singh, Preity Zinta), Agni Varsha ( Jackie Shroff, Raveena Tandon, Amitabh Bachchan), Kaante ( Amitabh Bachchan, Sanjay Dutt, Sunil Shetty, Lucky Ali), Aankhen ( Amitabh Bachchan, Akshay Kumar, Arjun Rampal, Sushmita Sen, Paresh Rawal), Hum Kisise Kum Nahin ( Amitabh Bachchan, Sanjay Dutt, Ajay Devgan, Aishwarya Rai), Kabhi Khushi Kabhie Gham ( Amitabh Bachchan, Jaya Bachchan, Shah Rukh Khan, Hrithik Roshan, Kajol, Kareena Kapoor), Amar Akbar Anthony ( Amitabh Bachchan, Vinod Khanna, Rishi Kapoor, Parveen Babi, Shabana Azmi, Neetu Singh, Pran), Kabhie Kabhie ( Amitabh Bachchan, Simi Garewal, Shashi Kapoor, Rishi Kapoor, Neetu Singh), Don ( Zeenat Aman, Amitabh Bachchan, Pran), Deewar ( Amitabh Bachchan, Parveen Babi, Shashi Kapoor, Neetu Singh), Anand ( Rajesh Khanna, Amitabh Bachchan), Sholay ( Amitabh Bachchan, Dharmendra, Amjad Khan, Hema Malini, Jaya Bachchan), Aks ( Amitabh Bachchan, Manoj Bajpai, Nandita Das, Raveena Tandon), Ek Rishta ( Amitabh Bachchan, Akshay Kumar, Juhi Chawla, Karisma Kapoor), Mohabbatein ( Amitabh Bachchan, Shah Rukh Khan, Uday Chopra, Jugal Hansraj, Jimmy Shergill, Shamita Shetty, Kim Sharma, Preeti Jhangiani, Aishwarya Rai), Lawaaris ( Amitabh Bachchan, Zeenat Aman, Amjad Khan), Mrityudaata ( Amitabh Bachchan, Karisma Kapoor, Dimple Kapadia), Sooryavansham ( Amitabh Bachchan, Soundarya, Anupam Kher, Kader Khan), Kohram ( Amitabh Bachchan, Nana Patekar, Danny Denzongpa, Jackie Shroff, Tabu), Hindustan Ki Kasam ( Amitabh Bachchan, Ajay Devgan, Manisha Koirala, Sushmita Sen).